Like the G3's design, but can't afford the top-end price? Both AT&T and Sprint have an alternative that'll appeal to fans without making a huge dent in their wallet. The LG G3 Vigor (also known as the G3 Beat overseas) is a new 5-inch phone with a price of just $312 off contract at Sprint. Not too bad, eh? It comes out on Sept. 19—the same day Apple's iPhone 6 and iPhone 6 Plus hit the market. The G3 Vigor isn't going to blow your hair back with the latest specs, though it's still very respectable for its price. It sports a 5-inch (probably the most comfortable screen size) 1280 x 720 screen, a 1.2GHz quad-core processor, 1GB of RAM, an 8-megapixel camera with that same laser autofocus we saw on the G3, and a removable 2540mAh battery. Hey, this device isn't so bad. It also sports Android 4.4.2 out of the box, and supports microSD expansion (your starting storage is just 8GB). AT&T doesn't confirm when, exactly, it'll offer the LG G3 Vigor, or for how much. Sprint, meanwhile, confirmed that consumers will be able to pick the device up this Friday for just $312 or 24 monthly payments of $13. This isn't a bad deal at all, especially if you're fond of the G3's excellent design. Other G3 features coming over to the Vigor include the Smart Cleaning app, and a Smart Keyboard that adapts to your personal style. 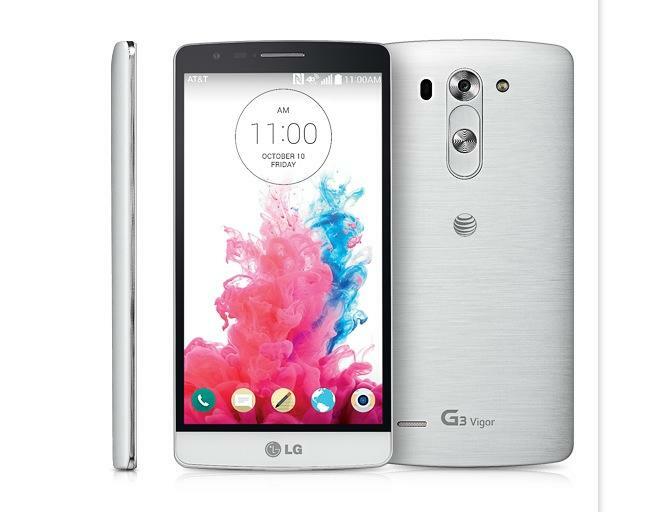 Sprint will offer the Vigor in Burgundy Red and Metallic Black; it looks like AT&T will offer a plain silver version.